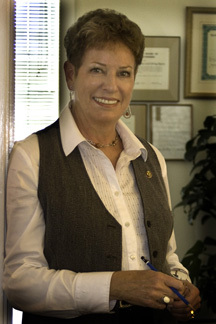 Jeanne Byrne, architect and former mayor of Pacific Grove, has filed papers to run for Trustee Area 4 of the Monterey Peninsula Water Management District Board in November, 2011. The seat is currently held by Regina Doyle who is currently serving her first term and is up for re-election. Doyle has not yet indicated whether she will be running. She reminds citizens that Peninsula residents face critical issues on water supply. “With the state about to virtually shut off our water supply, there will be no future for business and tourism, no future for our jobs and lifestyles,” she adds. As mayor of Pacific Grove from 1992-94, Byrne was pivotal in bringing the cities of Pacific Grove and Carmel onto the governance Board of the Fort Ord Reuse Authority. She has been active on a variety of City committees including the Building Standards Committee, Historic Resources and Chair of Architectural Review Committee. She continues to be a leader in the American Institute of Architects, Rotary Club, Pacific Grove Downtown Business Improvement District and Downtown Improvement Committee and is currently serving on the City’s Planning Commission. “I’ve come to Pacific Grove ever since I can remember, visiting my grandmother, and I’ve been a resident since 1977, living in my great-grandfather’s house,” Byrne states. Shortly after Byrne moved to the Peninsula, the water management district was formed with the original purpose to build the dam and then changed to build a water project. “I’ve watched so many proposals go nowhere, millions of dollars for studies and last-minute project delays. We can’t continue these tactics because we are out of time,” she said. “Without a water project to replace Carmel River pumping, the State Cease and Desist Order will require such severe water rationing by 2014 and 2016 that there will be no water for landscaping, businesses and recreation and water limits will be below the health standard for personal use. This will amount to loss of businesses, loss of jobs, reduction in home values and the loss of a future for our Peninsula. Byrne graduated from California State Polytechnic University at San Luis Obispo with a bachelor’s degree in architecture and spent a graduate year in Architecture in Florence, Italy. She was married to Ray Byrne 32 years ago at St. Mary’s by-the-Sea Episcopal Church in Pacific Grove. They have one son, Loren, who graduated from Pacific Grove High School in 2001. Trustee Area 4 consists of Pacific Grove and Pebble Beach and unincorporated areas adjacent to Carmel.